It's easy to paint apps and traditional boardgames as "rivals," even though so many games now offer both a physical version and a self-contained digital one. But the past few years have seen a growing trend of treating apps as components – just another part of the traditional game, packaged along with its dice, cards, board, and so on. Usually, these programs are optional, but greatly enhance the gaming experience. 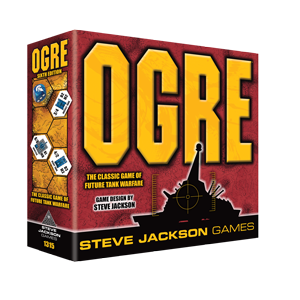 For example, our recent editions of Ogre include reusable sheets for tracking Ogre damage, but the free Ogre War Room app makes it far easier. But it's interesting to see companies taking this even further, with games that require an app yet are clearly still "boardgames," not "video games." I was recently introduced to Fantasy Flight's Mansions of Madness, a cooperative game that pits investigators versus Lovecraftian nightmares. A key part of the game is uncovering secret clues and evidence – you start each scenario unable to see the whole board and unaware of the victory condition! The first edition handled this by requiring one player to be the Keeper, a neutral GM, revealing new board tiles and secrets as the party explored. But the second edition shunts that work to a free app, allowing all of the players to actually play, while their tablet or smartphone tells them which rooms, cards, and lore they discover. I was hesitant at first, but it actually made things more immersive, by letting us keep our heads firmly in the role of investigators. I'm excited by these intersections of tabletop and digital, because I think each medium has its strengths and weaknesses, and by finding new ways to merge them, we can truly get the best of both worlds.